Editor's Note: Please read the Lowell's 11/3/17 comment under the post. "Mr. T, what's that thing attached to the fourth carbon on this structure?" "Are there hydrogens there or some other element?" I routinely get questions like this when I draw structures for my students because I simply don’t have good handwriting. This poor handwriting translates into poorly drawn Lewis Structures. I have had this issue since at least third grade when I earned a C in penmanship from Ms.Dodson. The problem is I get so excited to draw and explain the structures that I tend to draw too fast and have trouble going slow enough to draw good structures. 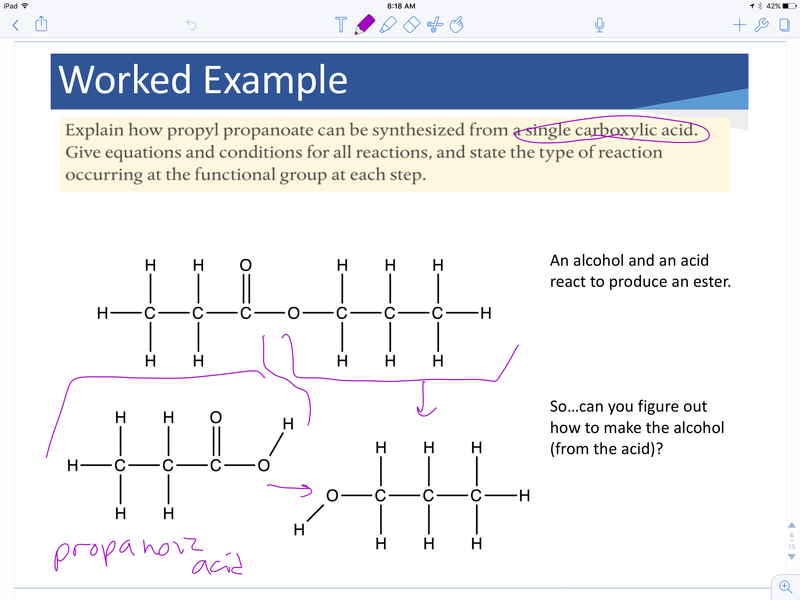 To help with this, I have started using ChemDraw for the iPad. It's $9.99 in the U.S. iPad App Store, and well worth the money in my opinion. The app has a relatively simple interface that makes drawing structures quite simple. And rather than use a bunch of words here, I would rather show you a couple images and share a video tutorial with you. First, an image from Notability where I drew some structures, just for context to show why I prefer to use ChemDraw rather than draw by hand. Next, an image from Notability with some structures from ChemDraw. I also recorded a tutorial to show you how I use ChemDraw to make my structures. A few final thoughts: If you have an iPad, I would suggest the ChemDraw app as a good purchase if you are teaching much organic chemistry - but even for just "standard" Lewis structures ChemDraw is a great tool to draw relatively clean structures. It certainly has some limitations, but I have found with a bit of practice I can create and manipulate the structures I want to show. My next goal: Gain enough proficiency that I can use ChemDraw on the spot for teaching, such as mechanisms. I need to become more comfortable with the electron-pushing arrows and such, but I am getting close! Do you use ChemDraw? Is there a feature you like that I didn't highlight or a technique you would like to share? What other iPad apps do you use that are chemistry-specific? 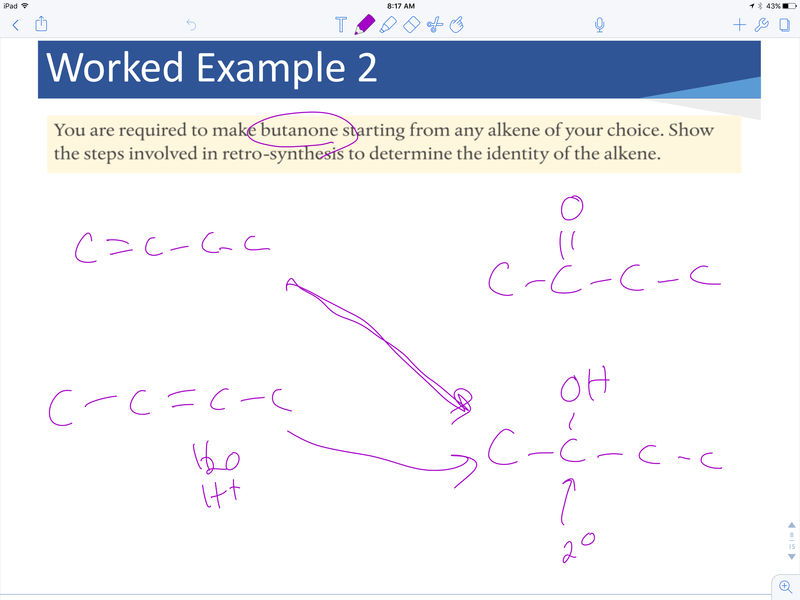 I've been using ChemDraw for quite some time to draw structures on my iPad. I was working this evening trying to prep a set of notes and went to open ChemDraw and got an error message that it wasn't compatible with iOS 11. In visiting the Perkin-Elmer website, apparently they've decided to discontinue the iPad app. This is a real bummer to me, as I thought it was a great app and well worth the price. So, if you've already purchased ChemDraw for your iPad - and not yet updated to iOS 11...do so at your own risk. You will lose access to ChemDraw (and possible some other apps on your iPad as well).